Last month I was so lucky and honoured to be asked to be Godmother to my lovely friends Louise and Paul’s little girl Suzie. 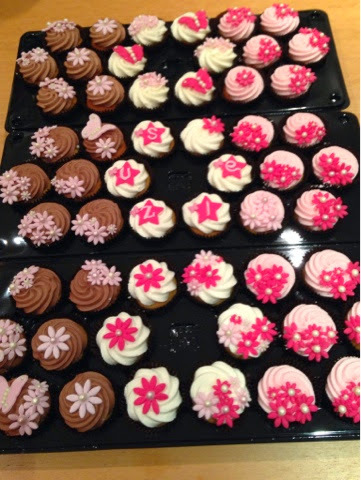 I offered to make cup cakes but was limited for time as Louise had invited lots of people, and I had a busy week planned myself. 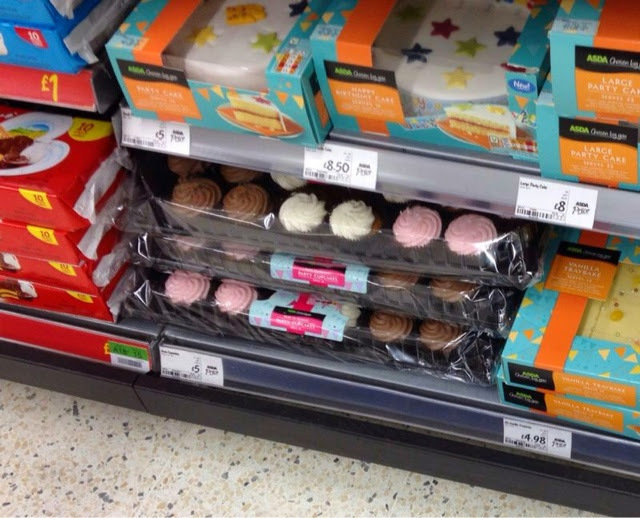 Louise came up the idea of buying ready iced cakes from Asda to decorate. This was a great idea and the colours fit in perfectly with the theme of the Christening. 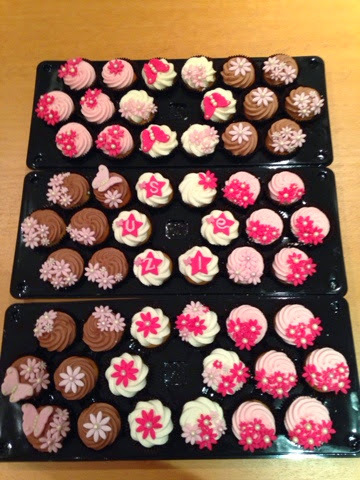 The cakes cost £5.00 for 18, bargain yes the icing did not taste as good as home make but they did still taste good. Louise wanted Girly pink flowers and butterfly’s, having boys I was so excited by this, I already had flower and butterfly sugar paste cutters,but I rarely get to use them. 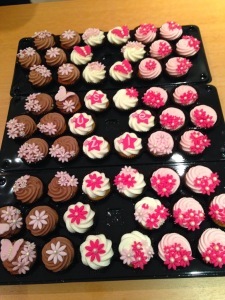 Louise chose dark and light pink sugar paste and white sugar balls for the centre of the flowers. I decided create a contrast on the cakes and did a few different designs. Joe was kind enough to give me moral support throughout the whole decorating process, and talked to me all the way through! I must have cut off at one point as apparently he asked if he could decorate a cake and I agreed. Lets just say his beautiful effort had to be remodelled when he was not looking. 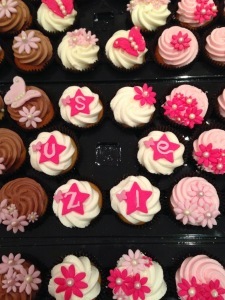 I decorated the centre cakes with Suzie’s name on little stars, to create a focal point when on the cake stand. I was so pleased with way the cakes looked, unfortunately for Joe the guests at the christening ate them quickly, so he didn’t get to eat one! A huge relief on my part that they looked edible.